Great day on the beach for “Lieutenant Mitch Buchannon”. Beat up bad guys, saved a puppy from drowning and gave a woman mouth to mouth, who I think totoally pretended to drown so I’d save her. #OnSet #BAYWATCH #TheBuchannonWay #RowdyAndRatedR We’re havin’ a blast.. The Rock doesn’t just play heroic characters – he’s one in real life too. Dwayne Johnson responded to a seven-year-old cancer patient’s wish to meet his hero, and the lucky kid will meet him on the set of Baywatch, Complex reports. Gabriel Singleton, more affectionately known as ‘Tater’, has spent more than half of his life in cancer treatment. He sparked a windfall of social media support after Children’s Hospital at Erlanger shared a photo of his handwritten letter on Facebook. Losing my hair made me sad, but seeing you rock your bald head made it easier! You inspire me with your positive attitude. Please share this picture so The Rock will come visit me! On Wednesday, The Rock promised Tater something even better and invited him to chill on the set of Baywatch’s big-screen revival. Tater! Guess what buddy? I’m coming to meet you!! I want you to be my special guest on our #BAYWATCH set in Savannah, GA. Everyone on set is excited to meet you… especially the pretty girls! Uh oh???. Tater, not only am I super pumped to meet you, but I’m a big bald headed LUCKY DUDE to meet you as well. Big man you’re way stronger than I’ll ever be and you better get ready, because I hug like a bear! Can’t wait to meet you Tater and your family big man! Stay strong! Your buddy ~ DJ PS: Your nickname “Tater” is almost as cool as “Rock”. Actually it’s way cooler. ??? Tater’s mother, Lulu Singleton, told WRCB-TV last month that the seven-year-old’s cancer is in his bones and bone marrow, and originally, it was everywhere. 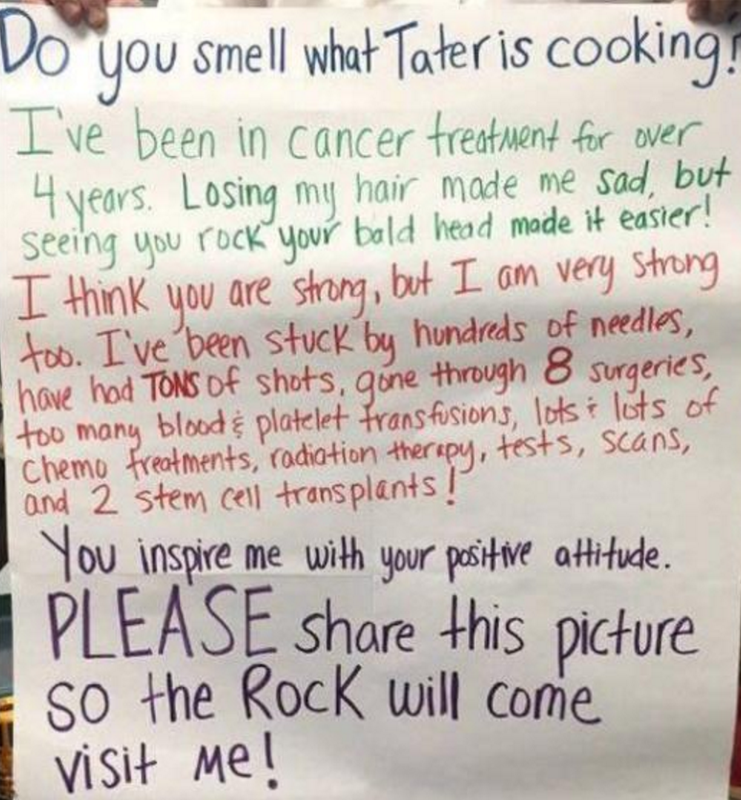 We can only guess how thrilled Tater must be to meet his hero and we hope he finds the strength to keep fighting.